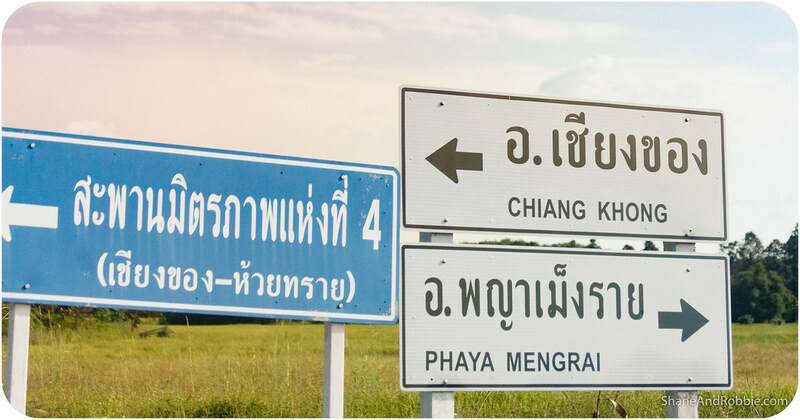 In the dialect of the Northern Thai people “chiang” means “city”, which is why so many towns up here are named that way. 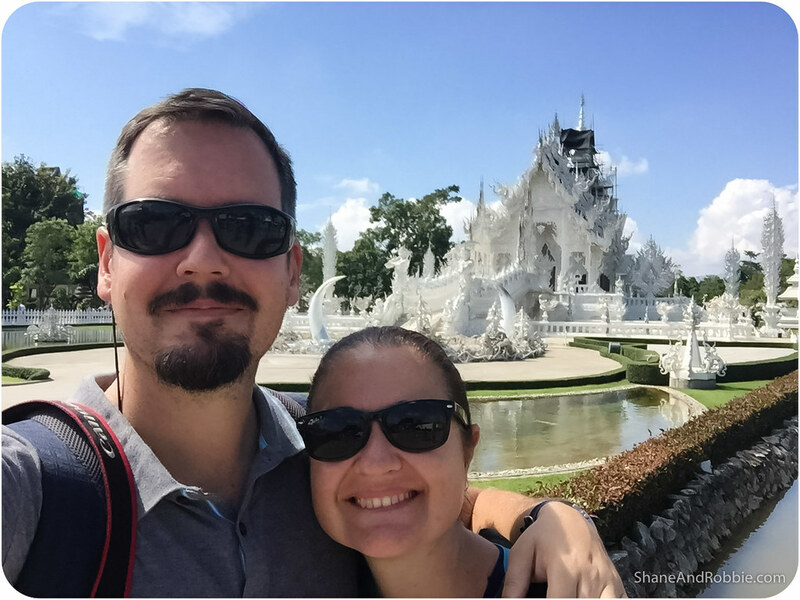 We’ve been staying in Chiang Mai the last couple of nights and today, on our way to the Thai/Laotian border, we visited a couple more “chiangs”: Chiang Rai and Chiang Khong. 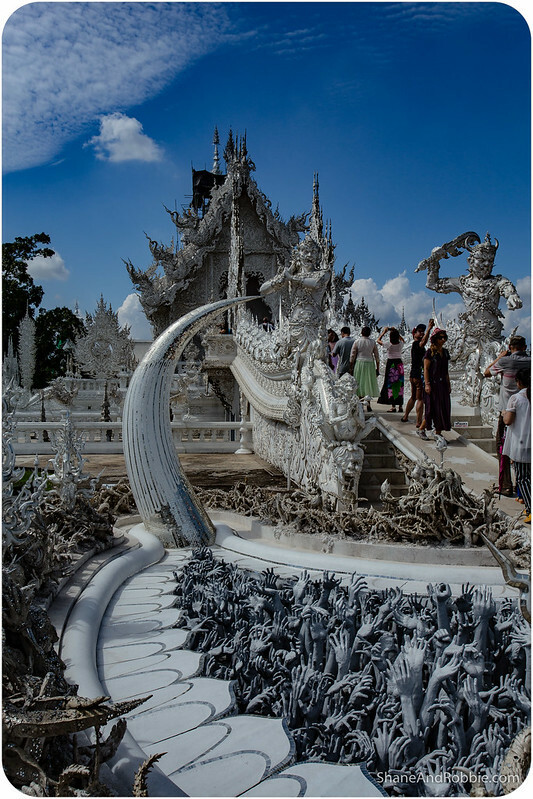 Chiang Rai sits about 160km North-East of Chiang Mai and is home to one of Thailand’s most unusual Buddhist temples: Wat Rong Khun, or the White Temple. 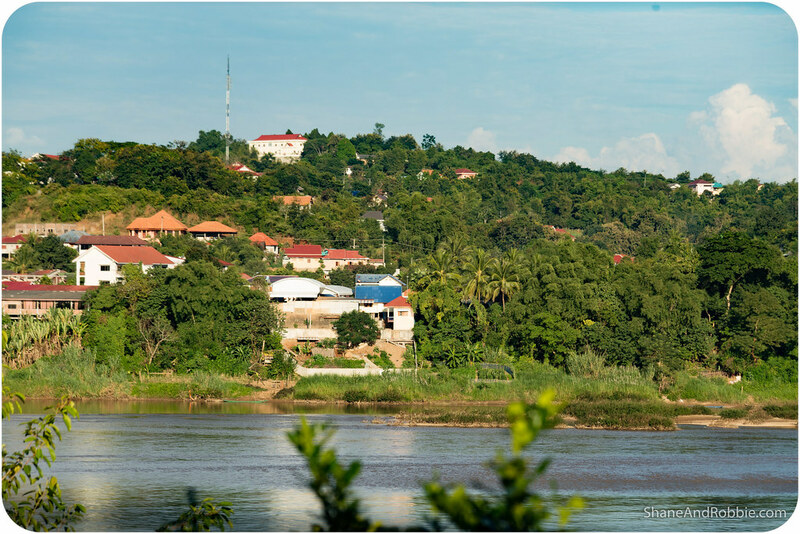 Chiang Kong, on the other hand, boasts one of Thailand’s most scenic views over the might Mekong River – which is why we’re staying here tonight; tomorrow we’re catching a slow boat down the Mekong into Laos! 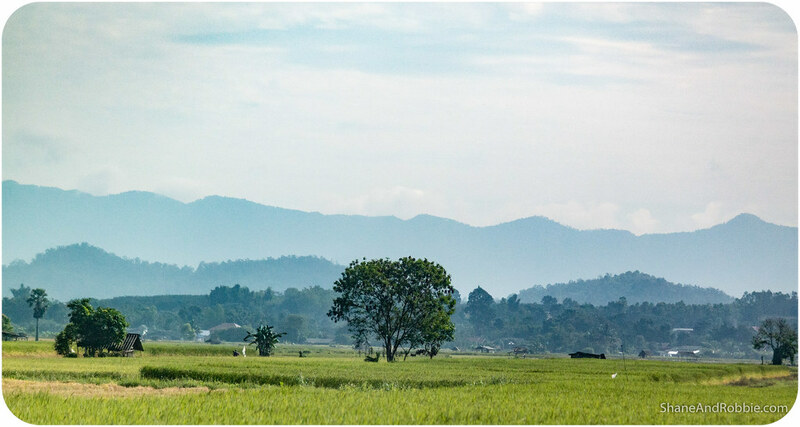 We started our road trip across Thailand’s Northern reaches early this morning, keen to get to the border before nightfall. The first part of our drive took us through numerous small towns and villages, all quiet thanks to the early hour. 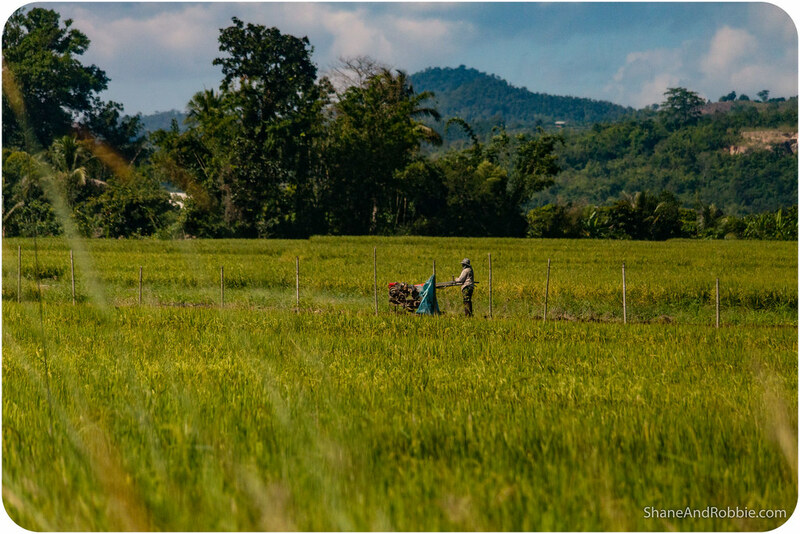 This part of Thailand is very rural and we passed numerous lychee and cashew farms along the way too. We stopped at one of these farms for a “happy house” break and we got to see how they grow, harvest, and prepare the cashews. It was interesting to see what a cashew fruit looks like and to learn how toxic the sap from the green cashew casing can be. Apparently locals here use cashews husks as protection against termites, throwing them down around their house and under their foundations to keep the hungry critters away. Ingenious! We arrived into Chiang Rai around lunch time and grabbed a quick wok-tossed meal there. 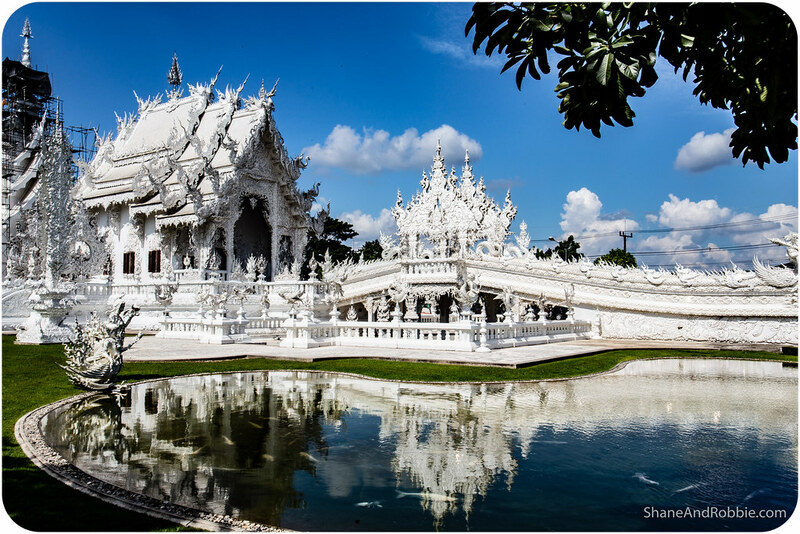 Chiang Rai is the Northern-most large city in Thailand. 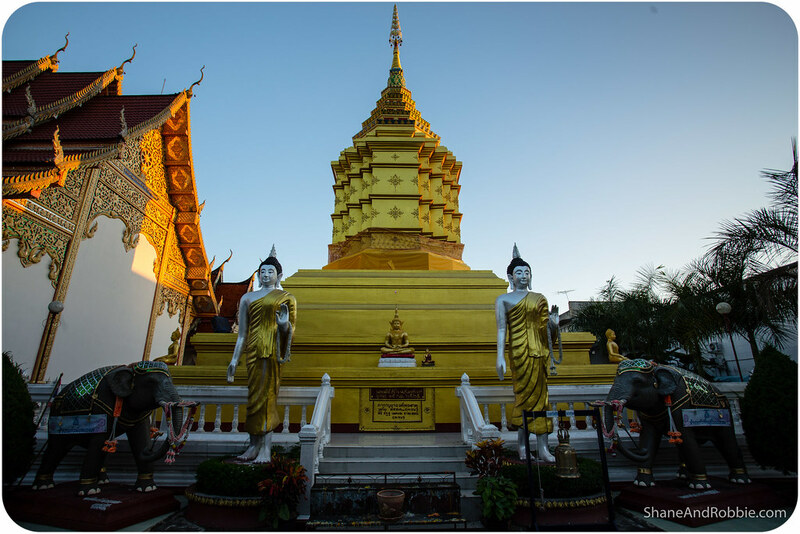 It was the capital city of the ancient Lanna kingdom before the court moved to Chiang Mai. 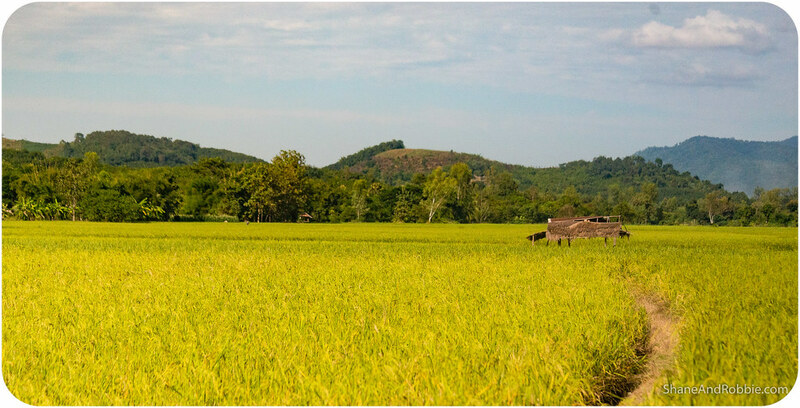 When the Lanna kingdom fell to the Burmese, Chiang Rai was conquered by Burma and remained under Burmese rule for several hundred years. 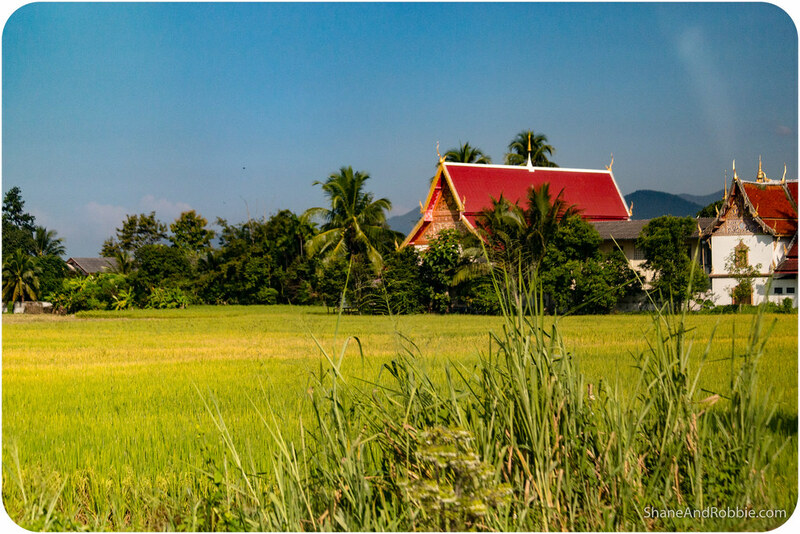 It was not until 1786 that Chiang Rai became part of Thailand. 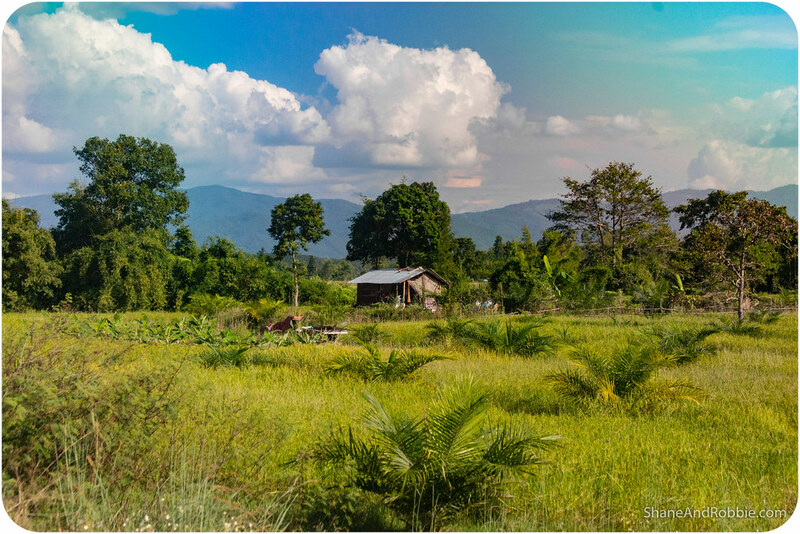 Today it’s a popular tourist stop and is often used as a base by people looking to explore the jungles of far Northern Thailand and the famed Golden Triangle, once the centre of the world’s opium trade. 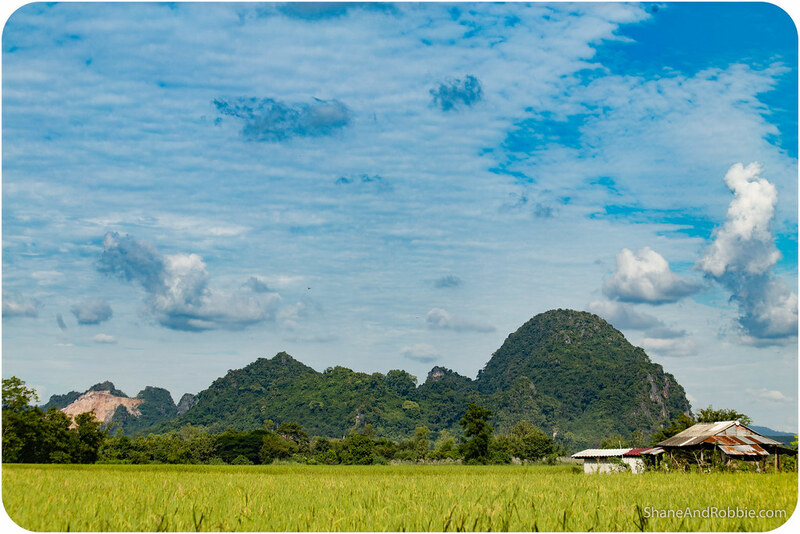 We chose to forgo those areas on this trip, but having seen how splendid the scenery around here is, we’re keen to come back soon to see more of Northern Thailand. 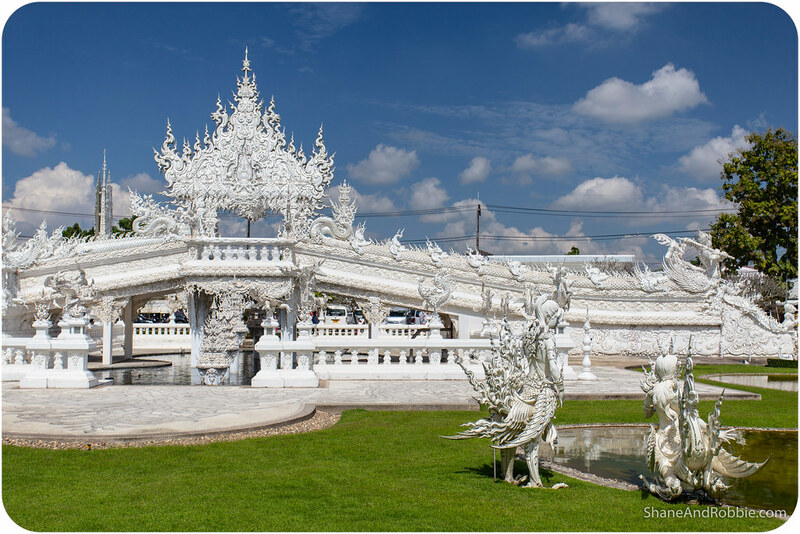 What we DID make time to see on this trip was Chiang Rai’s famous White Temple: Wat Rong Khun. 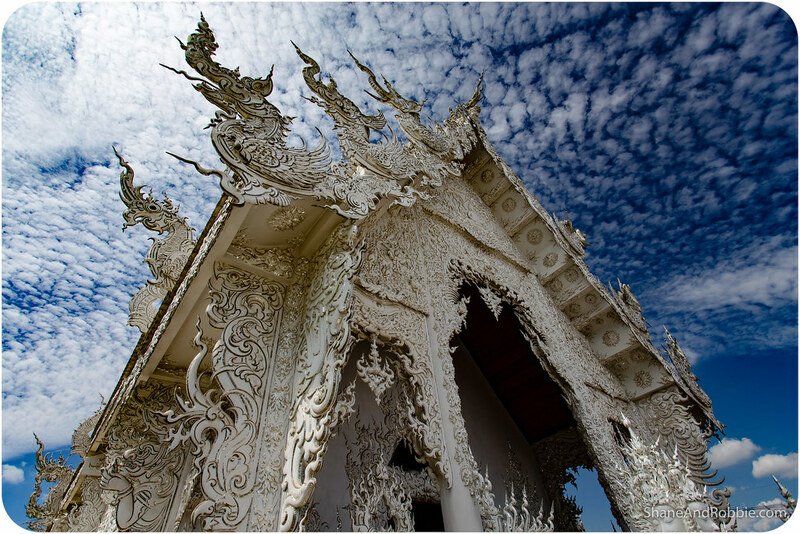 This unconventional temples is privately owned by Thai artist Chalermchai Kositpipat. 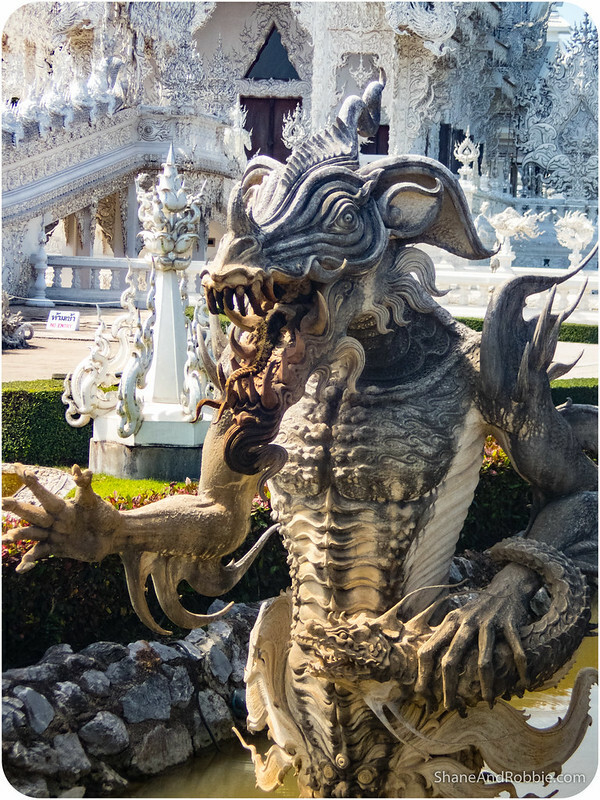 Chalermchai designed and built the temple himself and has created something truly unique in the process. 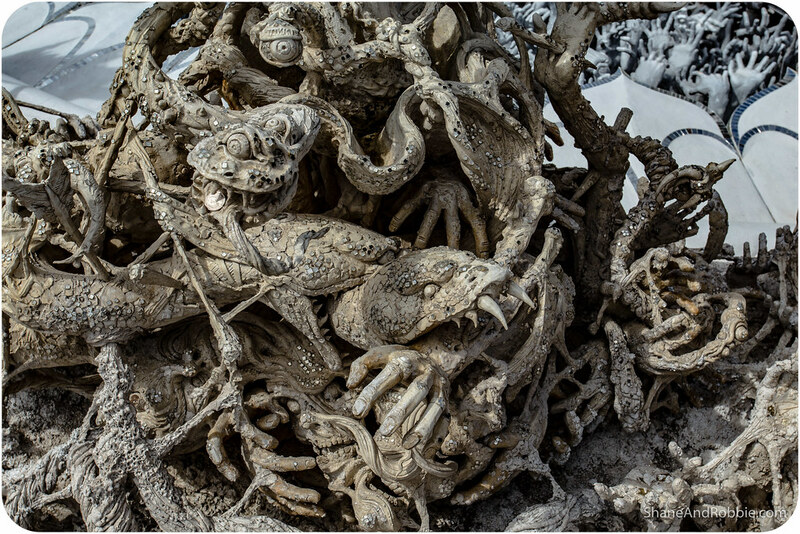 It’s an incredible work of art, with the entrance decorated in motifs representing the demons and tribulations of Hell, and the inside of the temple (which you are not allowed to photograph) decorated in things representative of Heaven. What was really interesting was the mixture of traditional Thai/Buddhist imagery and modern pop culture references. 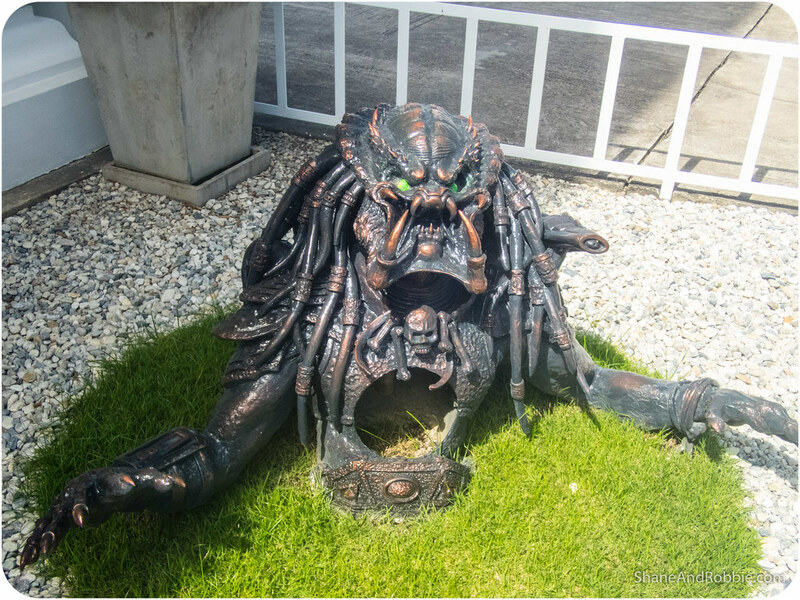 Batman, Wolverine, the alien Predator, they all featured in Chalermchai’s work, creating a fascinating array of sculptures. 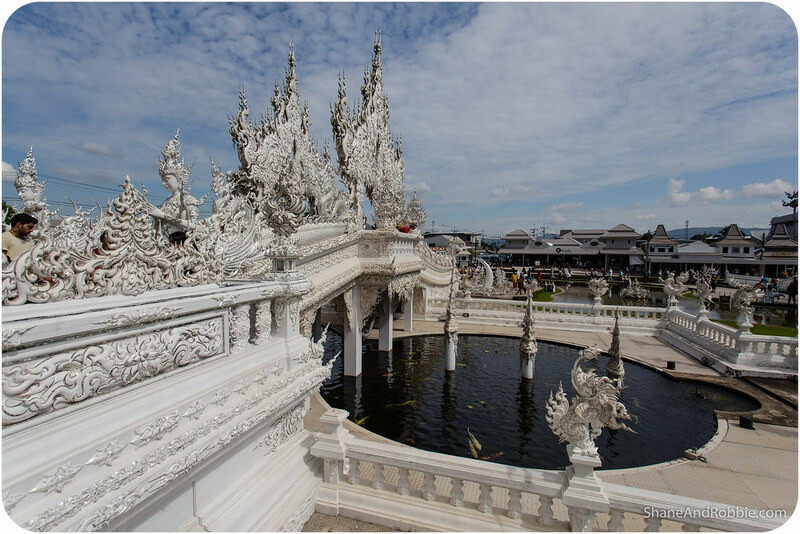 Chalermchai Kositpipat has been working on the temple for some 20 years and charges no admission to visitors who want to come and admire his handiwork. He also accepts no large donations* from ay person or body, and is adamant that he wants to fund the work himself (and thus retain control of the project). 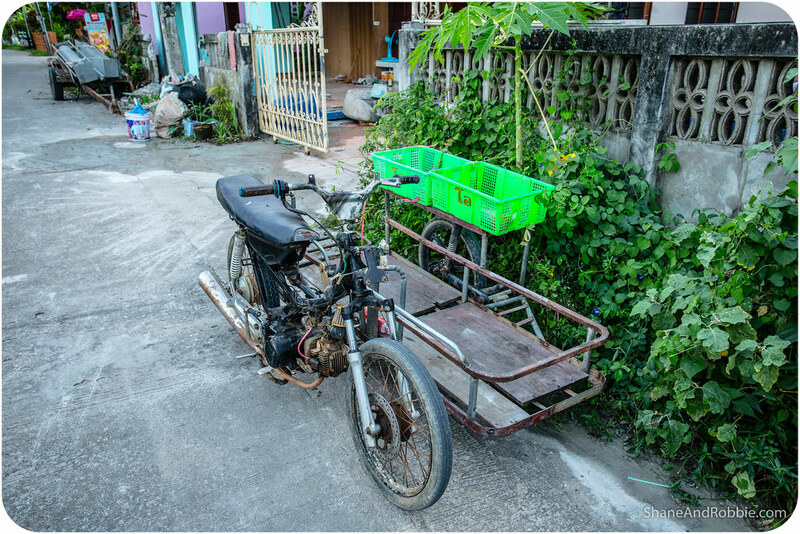 To date, Chalermchai has spent 40 million Baht of his own money on the project. 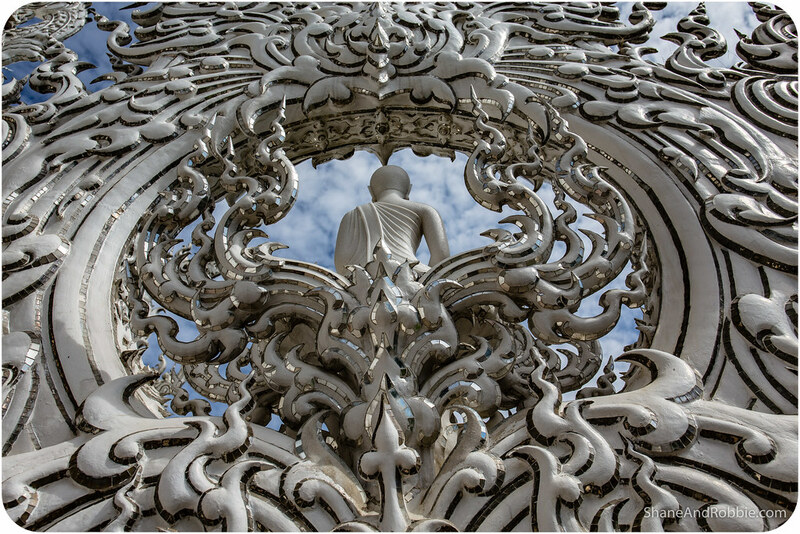 The artist intends for the area adjacent to the temple to be a centre of Buddhist learning and meditation. 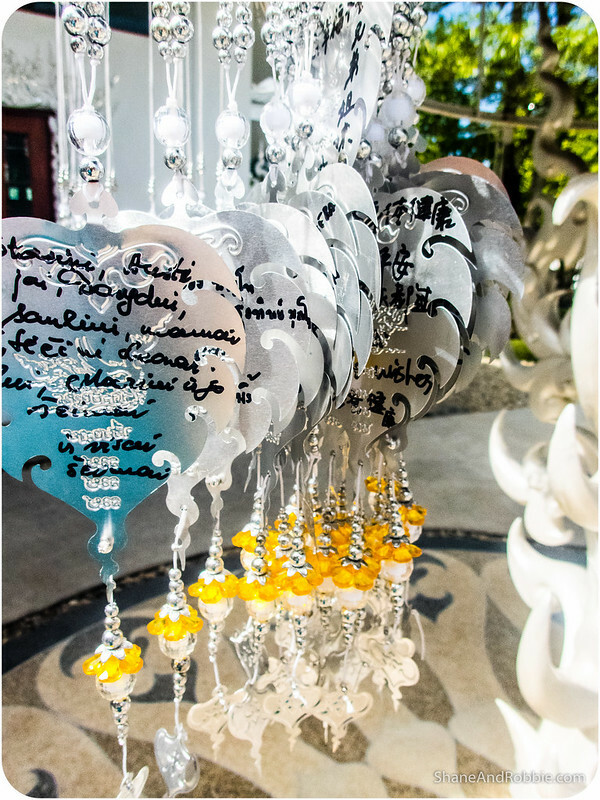 *Donations of less than 10,000 Baht are welcome and when you make a donation you get a small metallic heart to write your name and your prayer/wish on. 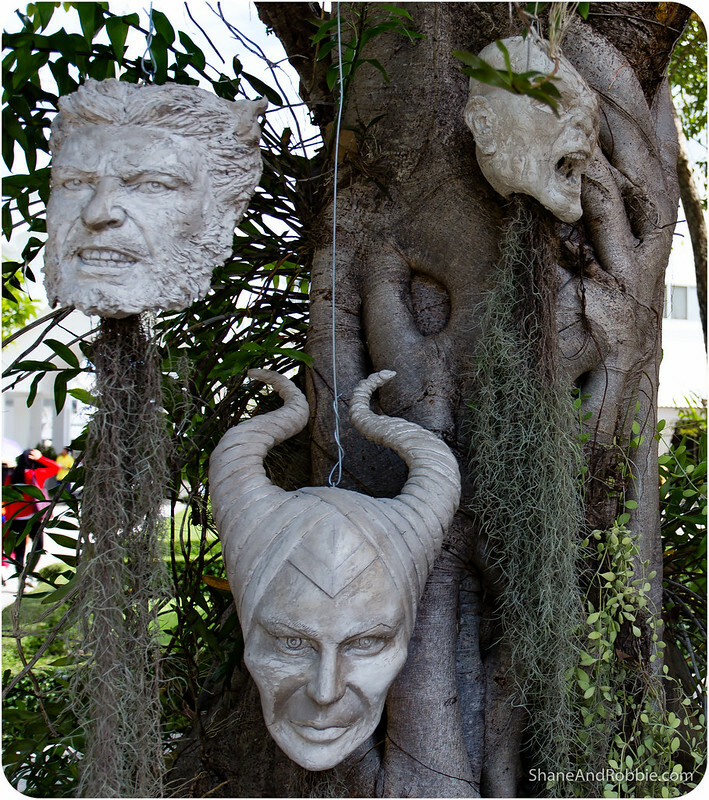 These were hung all around the temple grounds and number in the hundreds of thousands. 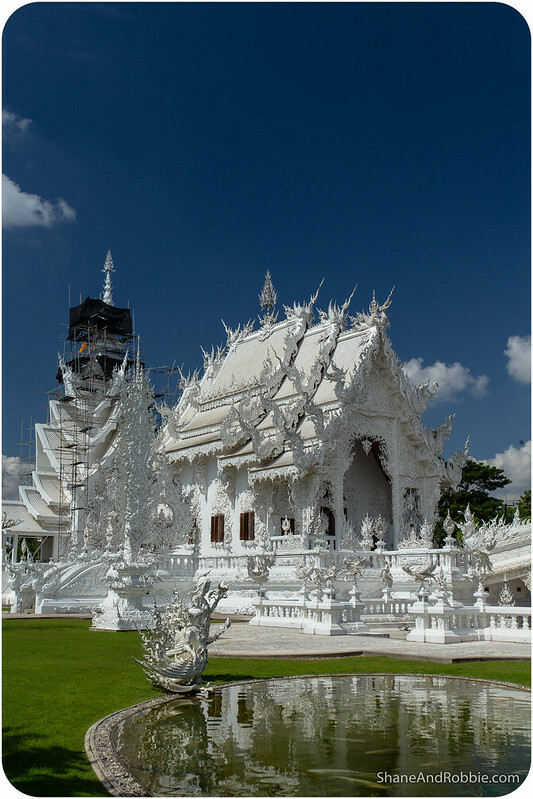 Signs around the temple explain some of the symbolism inherent in the temple; the incredibly detailed, all-white exterior, for example, represents Buddha’s purity. Mirrored trimming symbolises self-reflection, and the bridge to the temple entrance represents the path one must walk to resist the temptations of Hell. In front of the bridge are hundreds of outreaching hands that symbolise temptation and desire. The bridge shows the way to happiness is by foregoing temptation, greed, and desire. It’s all rather fascinating, though quite macabre in a way. 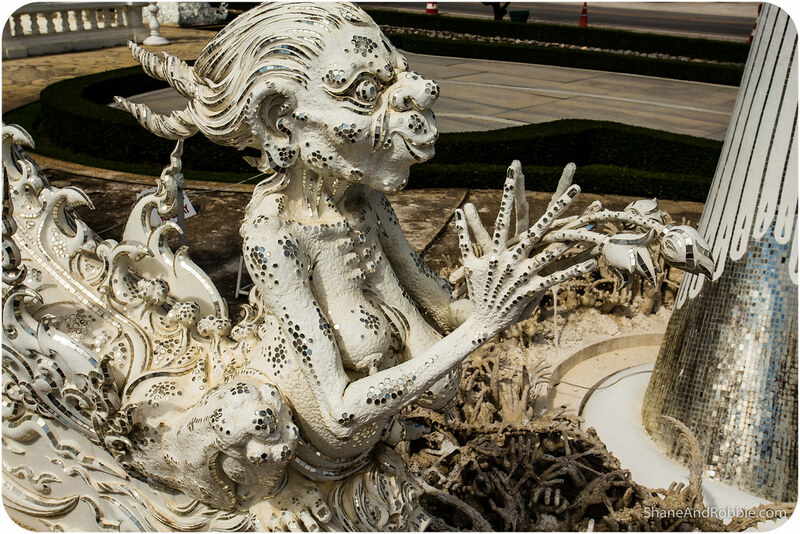 Wat Rong Khun is without a doubt the most interesting temple we’ve sene in Thailand (so far). Even if the significance of some of the imagery used was a bit lost on us, we still left with a profound respect for the artists’s vision and passion for his project. 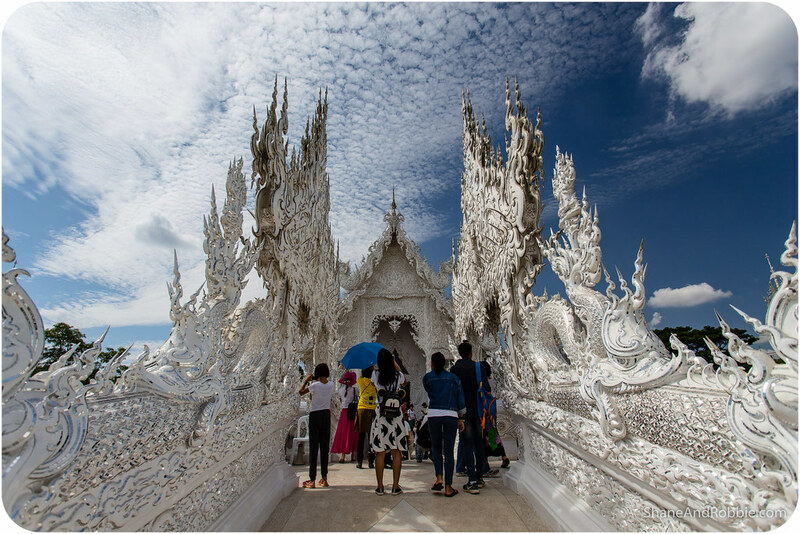 Interesting to see too how many tourists the temple attracts to Chiang Rai – and not just foreigners, there were lots and lost of Thai tourists there too. 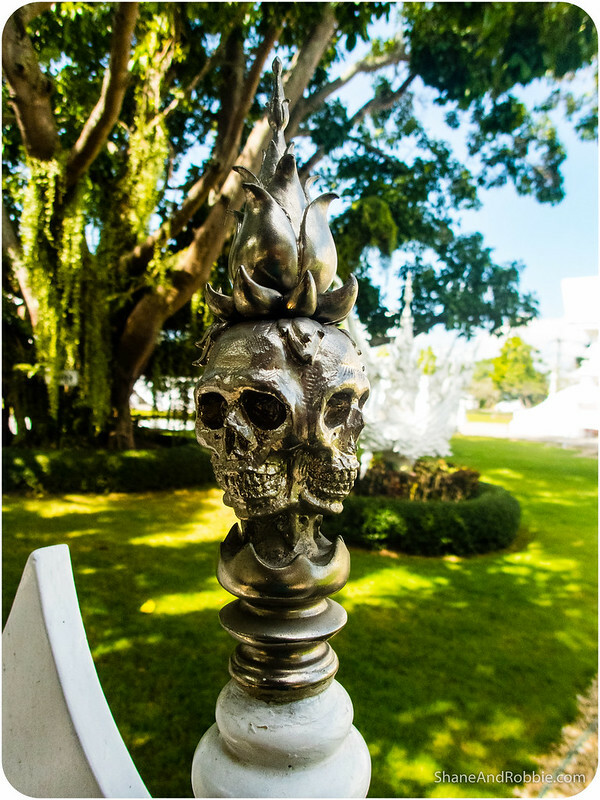 Seems EVERYONE is intrigued by Chalermchai Kositpipat’s creation! 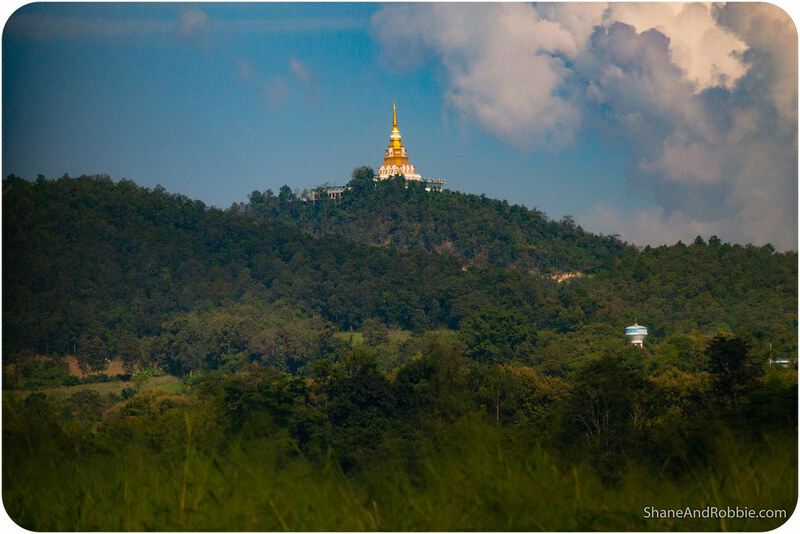 From the temple we continued on to Chiang Khong, another 80km further North and East. 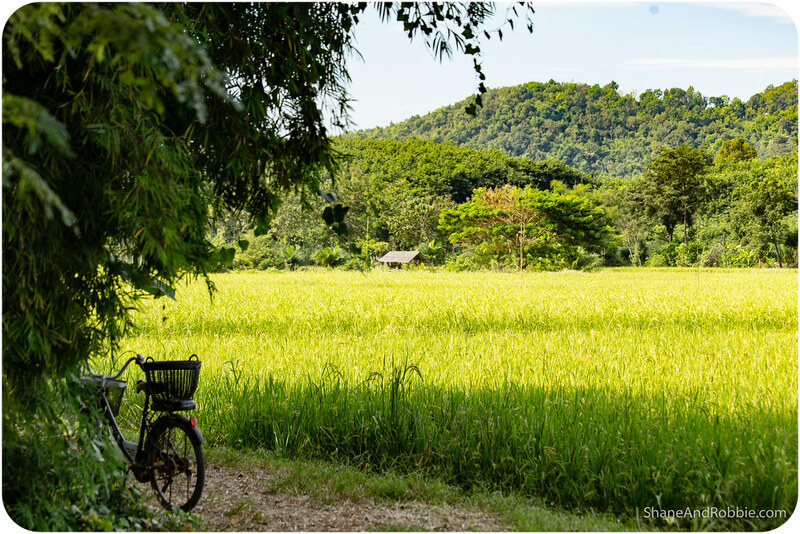 The scenery along the way remained glorious, with fields of fruit trees replaced by rice paddies. 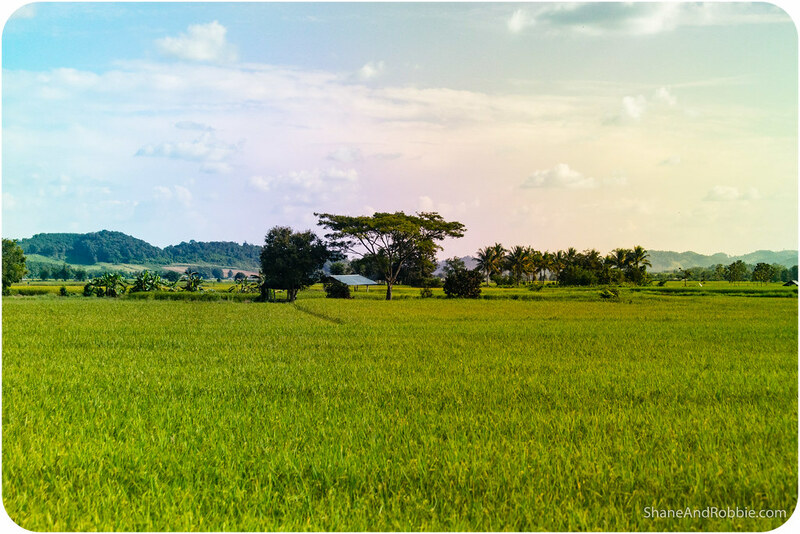 Being the end of the rainy season (the dry season starts in December), the rice is fully grown and just about ready for harvested. In some areas, in fact, the grains had already been harvested and the fields lay burnt and blackened. 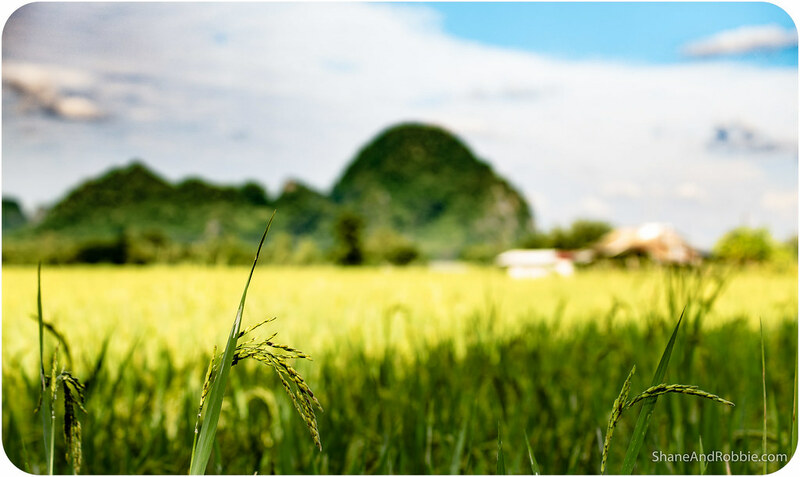 Being so wet and fertile, rice fields in Norther Thailand yield 3 crops a year, so the farmers are continuously at work, planting, harvesting, and tilling the fields. We reached Chiang Khong around 4:30pm, tired but content after our long travel day. 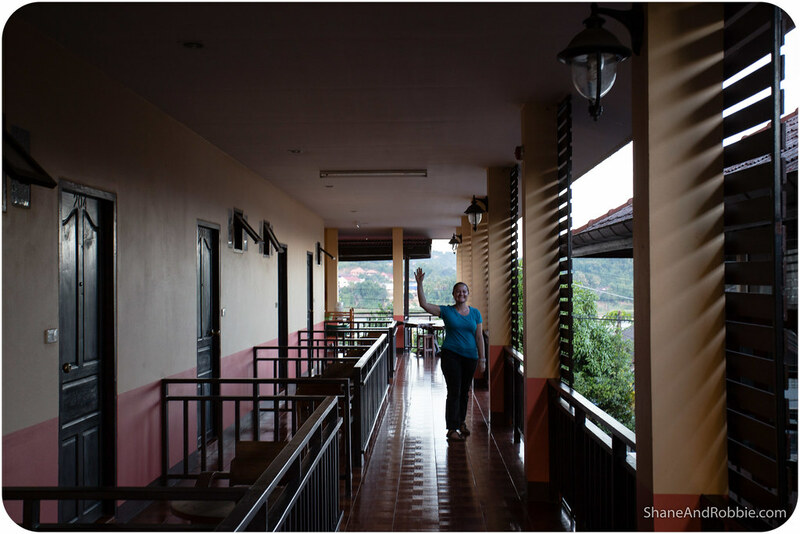 After checking into our guesthouse and dropping our bags off, we went for a walk to stretch our legs and explore the tiny town that is Chiang Khong. 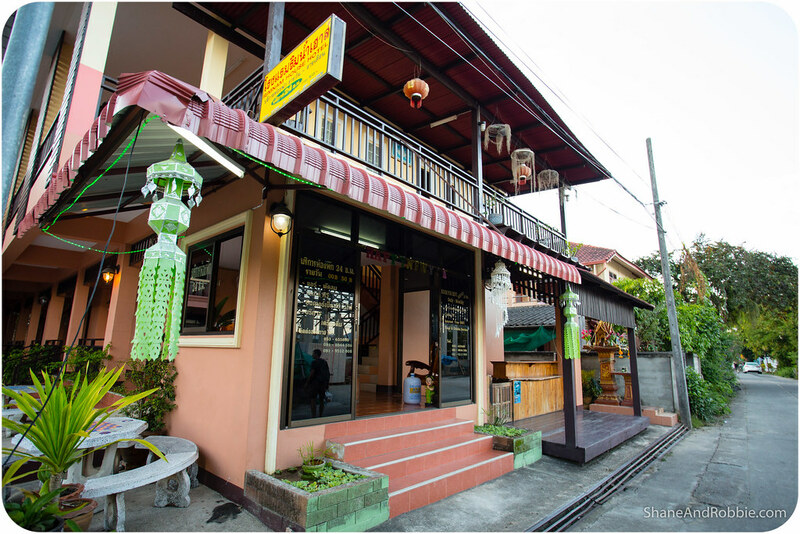 Situated on the Mekong River, which forms the border between Thailand and Laos for much of its length, Chiang Khong is a border town. 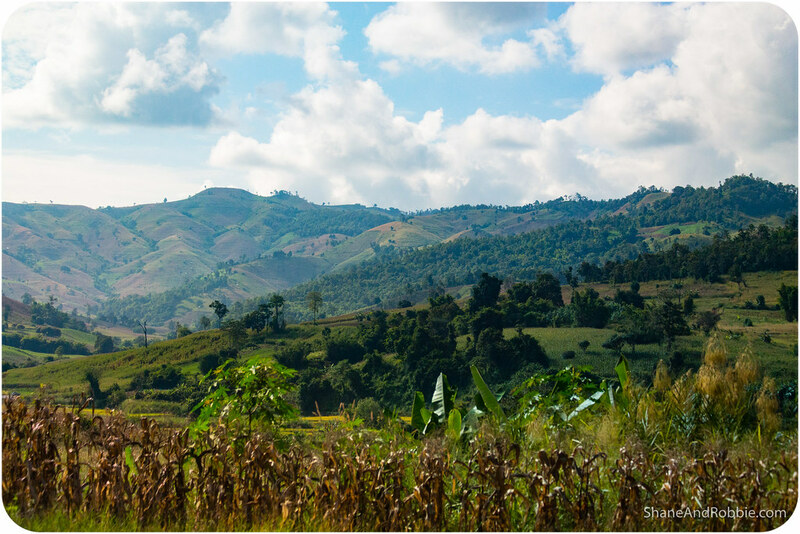 Unlike many border towns we’ve passed through, however, it doesn’t have that air of shabbiness that seems to come with being on the edge of civilisation. 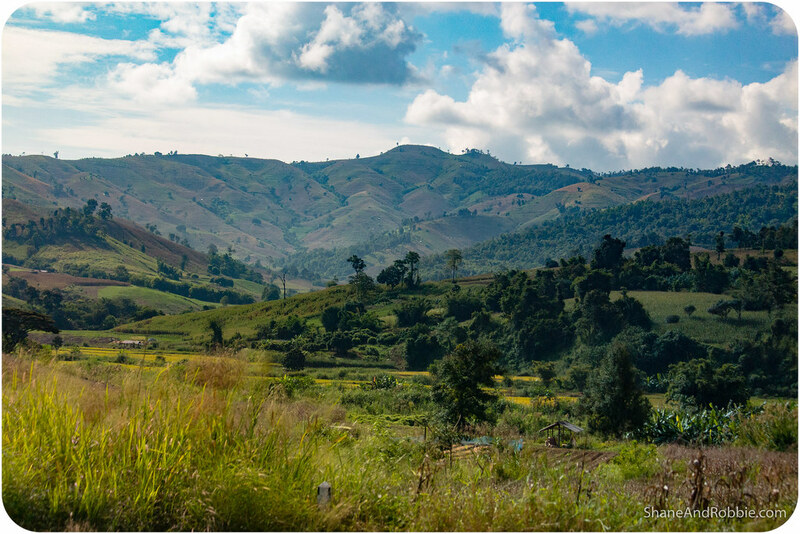 Whilst the town is certainly small and has no real tourist attractions to speak of*, it’s clean and easy to navigate – there’s even a 7-Eleven to stop at if you need to stock up on snacks and water before hopping across to Laos. *There is a lovely temple in town you can visit, and a market where you buy basic food items, but that’s about it. We quickly realised there wasn’t much to see in town, and so spent our time walking along the riverfront promenade instead. As the sun set we stopped in at a local restaurant for dinner, which was great – as all the food in Thailand has been. 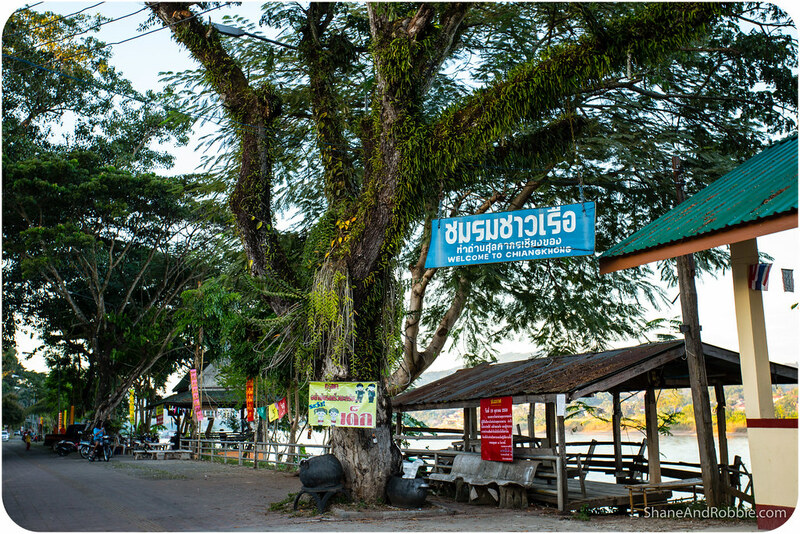 Like us, most people that stop in Chiang Khong come here to get stamped out of Thailand before crossing the border into Laos. For now this is our last night in Thailand*, which we’re quite sad about as we have just LOVED Thailand so far; but we’re equally excited about crossing the border and catching a boat down the Mekong from Huay Xai, the Laotian town just across the water. 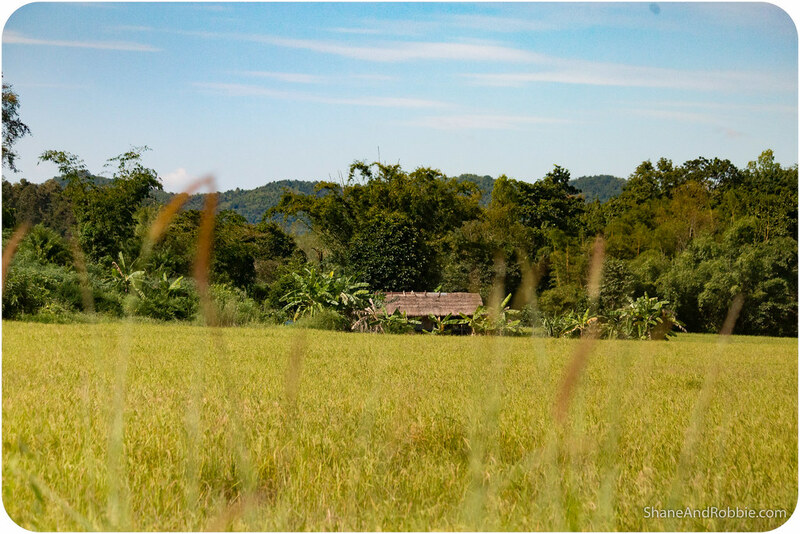 Join us tomorrow if you to find out how our border crossing went and see what Norther Laos looks like! *We’re coming back to Thailand after we’ve been to Laos, Vietnam, and Cambodia. But that’s another month away!